Above posts are not suitable for physically handicapped candidates. Reserved category candidates will also get relaxation in maximum age Limit. 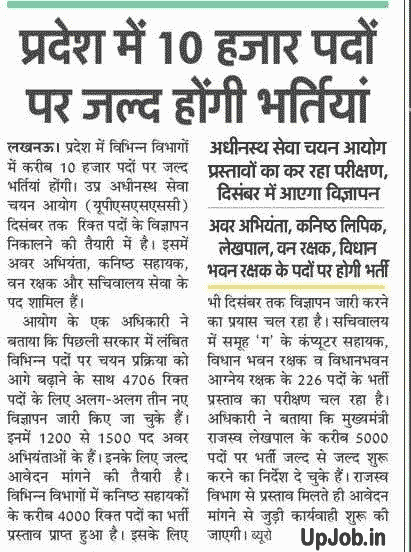 Selection for Vidhan Bhawan rakshak and Vidhan bhavan agni rakshak will be done through Physical Efficiency test , Medical Test ,written examination and personal interview test . Selection for Van Jeev rakshak, van rakshak posts will be based on through Written Exam, Personal interview, Physical Test, Physical Efficiency Test PET , and Medical stander test . Physical test, Medical Test, PST / PET will be qualifying nature only. PET Test : male candidates are required to complete 25 km race with having load of 10 kg writing 4 hr and female candidates are required to complete 14 km race in 4 hr.